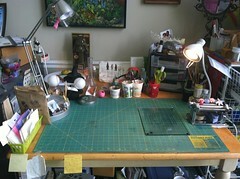 Pithy Art Blog: So excited the table is clean! So excited the table is clean! Its May and I'm back! I've learned a lot these past two semesters. With the bulk of it this most recent semester. I am more educated, but in reality I have no further interest in using my degree. (Not too good since I paid for it out with my dime.) I realize it has not, and will not in the foreseeable future add to my employability. I have also discovered its time to find out how to really make what it is I want to do a reality. A viable reality. So I will be using this blog for that journey, because that journey involves art daily: crafting and painting and clay. It involves teaching creativity to kids, and finding it for myself. This journey involves actually learning and applying marketing and business techniques. My goal is to get back to art. As Picasso said "art washes away from the soul the dust of everyday life." Well I have discovered that art soothes my soul, and can bring me back from deep dark depression. This says to me it is not a luxury but a necessity. And it all starts with a clean desk.